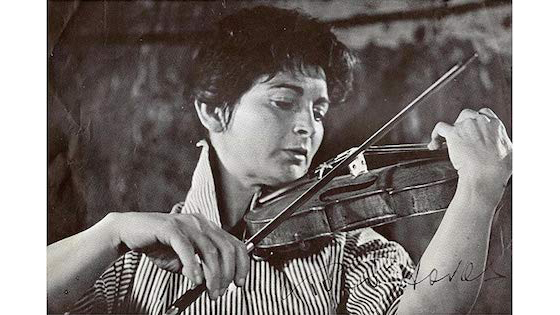 January 15, 2019, 2:27 PM · The pioneering Hungarian violinist and teacher Kató Havas died on New Year's Eve at age 98, according to her website. Havas was best known for her teachings that address natural positioning, injury prevention and stage fright for violinists and violists, having taught numerous classes and published several books and videos. A New Approach to Violin Playing, which was first published in 1961 and contained a foreword by Yehudi Menuhin, took a whole-body approach to the mechanics of violin playing, insisting on a natural approach to positioning in order to help eliminate tension and create balance. Stage Fright: Its Causes and Cures offers exercises to help conquer stage fright, addressing its physical, mental and social aspects. Over the years, Violinist.com members have praised the power of Havas' teaching to help bring about more ease in their playing. "To know her is to be truly inspired by her and to learn to love performing, practicing and playing," said Kristian Svennevig in a 2014 discussion on Violinist.com about Havas. Svennevig studied with Havas at a weeklong workshop in the early '90s. "Her teaching of the bow arm and also methods to overcome fears and clutching of the violin are pure gold!...She taught me in 5 minutes what i spent a whole semester in college learning." Born in Hungary, Havas started playing the violin at age five, was performing by age seven and made a Carnegie Hall debut at the age of 17. She studied with Imre Waldbauer at the Royal Academy in Budapest, according to her biography.. She was also influenced by Hungarian gypsy violin players. She gave numerous workshops around the world and founded Purbeck Music Festival in Dorset, the Roehampton Music Festival in London and the International Festival in Oxford. Among her awards: a 1992 Isaac Stern International Award from the American String Teachers Association; a 2002 appointment to the Order of the British Empire (OBE) in the Queen's Birthday Honors; and a lifelong achievement award in 2013 from the European Teachers' Association. Please share your remembrances or thoughts about Kató Havas below in the comments section. Discussion: Resources on the Hungarian school of violin playing? January 15, 2019 at 09:44 PM · In the picture she seems to be using a shoulder rest. January 15, 2019 at 11:48 PM · I took Kato Havas,s 12 lesson course in London in 1975. She taught me much about posture and relaxation, and one exercise ,to put one,s consciousness in the correct place, was to play with a scarf covering the eyes. This was new and not easy for me , but certainly did away with some old habits. I found much more ease in performing on both violin and viola and adjusting to the different size, after applying her method. I remember her long lessons being interesting and alive,and to make her point,she wrote in my notebook with huge writing. I attended 2 of her Dorset Summer Schools which were also very inspiring. I am very grateful for what I received from Kato Havas and use many of her principles in my teaching. January 16, 2019 at 12:07 PM · This woman had a huge impact on my playing and I am forever grateful! January 16, 2019 at 04:27 PM · Kato Havas in a strange (but wonderful way) was instrumental in helping repair my damaged brain as a result of a car accident in 1994. I found a copy of her book 'A New Approach to Violin Playing' and that set me on a long path to a recovery. Along with her other books and attendance at many workshops in Oxford I have found and retained a beautiful tone. I have played outdoors in a street in Inverness Scotland and outside a locked field in Ireland just to prove that fright can be managed if the music comes first and you enjoy the occasion. Yes I have played indoors at churches and folk clubs in England and Ireland. I and my wife (Josie) have been blessed with Kato's patience and guidance, and I thank God for Kato's presence; may Kato Havas OBE Rest IN Peace. January 17, 2019 at 11:14 PM · I'm immensely grateful to Kato Havas because, thanks to her teaching and friendship, now I can play solo in whatever situation and enjoy it. I used to be extremely nervous, like the great majority of musicians although they don't admit it. I studied at Milan (Italy) conservatoire, which is considered a very good school, but in the end I didn't feel confident. I read her book Stage Fright, then I translated it in Italian and later the other two books of hers. Then I moved to Oxford to study with her and I'm still there, and I'm going to say goodbye to her for the last time at her funeral. Way too many players have benefited from her teachings in secret, without acknowledging her (as the article in The Strad says), which is really unfair. Now everybody talks about musicians' injuries and stage fright elimination (but not 60 years ago) and many concepts of hers have become "public domain". She ways way ahead of her time. Nobody is perfect but, among the many famed teachers I met and asked for advice, she was the one who was able to help me regain confidence in my playing. It is high time that more players admit how they were helped by her. So struck by your stark words, '... and I'm going to say good bye to her for the last time at her Funeral', a Note of Sympathy & Condolences is pouring forth ... Let a Tear of Notes come for it/they are necessary expressions of genuine loss & mourning for a treasured person who opened your world of possibilities up for you and believed in you! Know that every time from this day forth, when you share lessons learned & phrases uttered by Kato Havas to you, all are signs of her immortality which shall never depart your soul and will live here on Earth to be entrusted to numerous others the rest of your Life . . . I used to love training it up to Oxford from Paddington on short phone call notice to make music in Oxford with true blue music lover's attending Brasnose & Magdalen Colleges, Oxford! January 19, 2019 at 04:38 PM · I've said before that I had six violin teachers -- from childhood till I finished the degree program. In reality, I had seven -- I count Kató Havas among them. Although I never met or studied with this lady in person, her teaching has been part of my musical life for a long time. I purchased a copy of her above-referenced book, A New Approach to Violin Playing, while I was still in school -- and right away found it logical and practical. January 22, 2019 at 03:38 PM · There is an audio recording with a transcript of an early interview in which Kato discussed her New Approach to Violin Playing and Stage Fright.